Most of us have always thought that ‘Beauty Pageant’ is all about being beautiful, being most intelligent, being most charismatic on stage and all about promotion of fashion and beauty products. For a laymen, the concept of Beauty pageant starts at ‘Beauty’ and ends at ‘Beauty’, they generally think its all about who is most beautiful. But, never ever we have thought that these beauty queens are not always up for fashion shows only. Most of the major beauty pageants are always related to some global cause and supporting various NGO’s for that cause by generating money from various events and functions. Beauty Queen uses her platform to reach global audience and this helps organisation to bring more advertiser to invest money in the show, whose portion goes to NGO’s supporting for the cause. Below are some most watched pageants of the years and the beauty queens are being idealized by many followers across the world. Miss Universe Organization is well known for selecting a girl who can set the stage on fire when she walks on it. They usually tend to select a kind of girl who is fierce and grab the attention of million eyes when she is passing by. Miss Universe winners is usually engaged in lot of modelling assignments and is busy with many fashion shows. The money she generates from these kind of events and charity shows, goes to the organizations supporting AIDS awareness. They support for the welfare of AIDS victim. Their slogan has become very famous ‘AID for AIDS‘. Miss World tends to select girls who look angelic, genuine, demure beauty and a girl next door types. They are usually good with communication skills and catches attention with their charisma all around. The CEO, Julia Morley, of Miss World is very firm about associating every participants with some cause. In fact, a fast track event called ‘Beauty With A Purpose’ is the main essence of Miss World finalist selection. It has got 1.5 times more points than other rounds. Every national delegate is supposed to submit a project on social welfare and the most genuine project is selected as a winner. 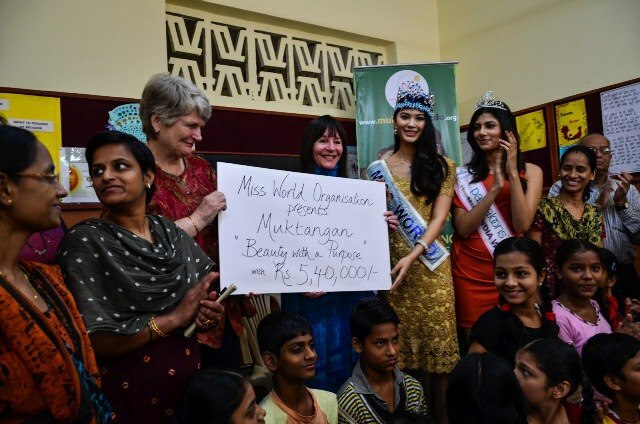 The cause of Miss World is collecting funds for underprivileged children. They collect money and donate it to the organizations supporting orphanages, child education etc. Miss World has actually been very successful in generating highest money for funds in charity compared to other pageants. Julia Morley has got very relations with many European and Asian countries that she can easily generate funds in millions. Miss Earth was formed to advocate for conserving environment. Miss Earth participants takes active part in Tree Plantations. Miss Earth winner becomes a spokesperson for conveying the message of her organisation ‘Save Mother Earth’. They have done lots of campaign on various pollution reduction awareness, they also lend their help during typhoon in Philippines. Miss Earth girls are also supposed to submit a Beauty for a Cause project, however there is no added advantage of winning that title. but still it makes difference as the girl gets appreciated for her efforts to do good for society. Miss International joins hands with NGO’s working for spreading peace across the countries and races. Something similar like UN, their message is to spread love and peace. The winner of Miss International does charity events who contributes for increasing awareness on universal brotherhood and promotes feelings of international friendship. Although, the cause of Supranational may not seem much of a social on superficial level, but it contributes a lot in the progress of a nation. Miss Supranational supports the tourism for the host country and various countries that winners visits during her reign. The cause of promoting tourism increases the GDP of a nation and help them to develop at a global level overall. Hence, I am sure, now whenever you think about Beauty Pageant, you won’t just think of show bizz, fashion and Beauty; but Beyond The BEAUTY..!! !